The question is should I paint some of the floors? One of the things that I wished I could have done when I purchased this home was to have the floors re-finished before moving in. The cost for such an endeavor made it not possible and it will remain not possible for sometime. The floors are truly in sad shape and some rooms are worse than others, but my bedroom is particularly in bad shape. There are water stains in various places, termite damage, paint spots and several gouges in the surface. I have my eye a large Persian rug for the room and like many of the other rooms these rugs cover much of the floors, but it’s the areas that are not covered that tend to be some of the worse areas. 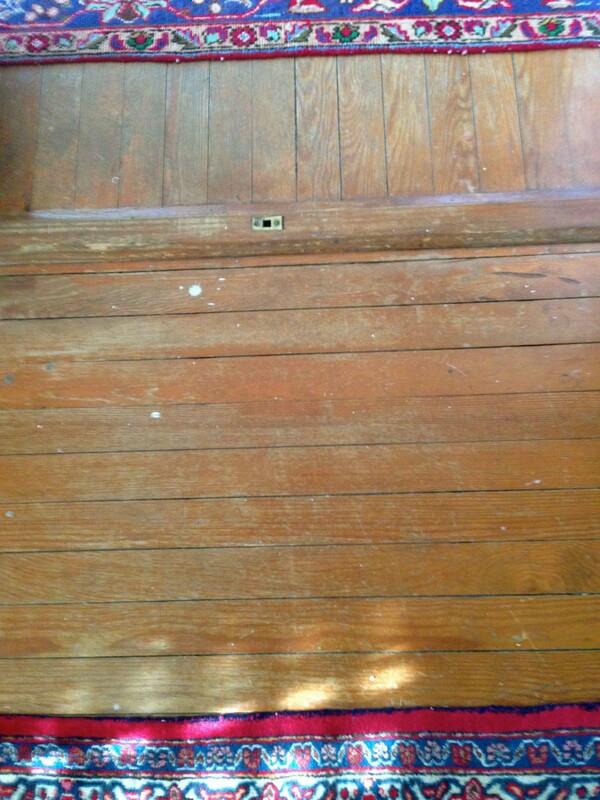 Library floor leading to sitting room floor. 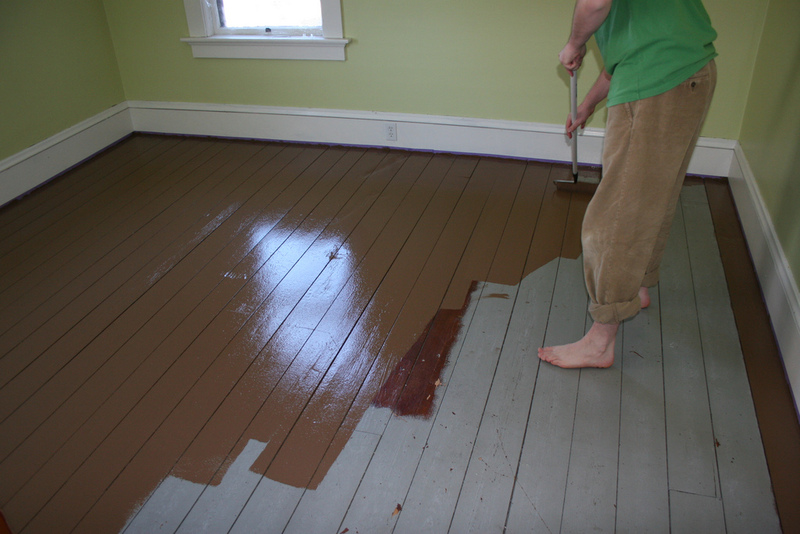 Many years ago I had rented a place where the landlords allowed me to paint the floors. They looked great, but for some reason I am feeling hesitation this time around. Perhaps because I own them now? The facts are I won’t be having these floors re-finished in my life time so it’s not my problem in the future if someone else decides to deal with the task. However, could it affect resale value? If I do paint the floors I don’t intend on painting all the floors in every room. 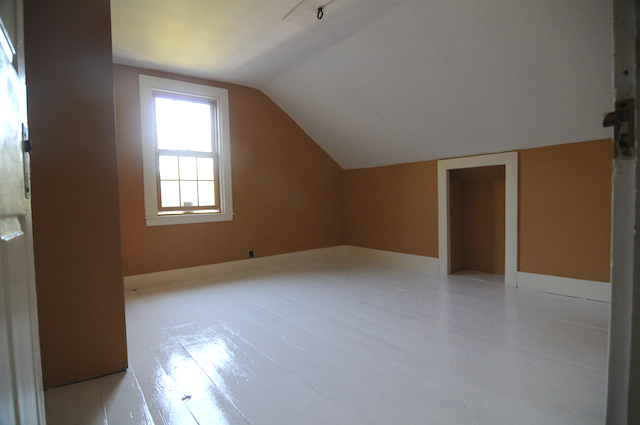 I am considering my bedroom and the hall between the two ground level bedrooms. As of now, the bedroom that will be my mother’s room is in limbo because she has mentioned she may have wall to wall carpeting (gasp) installed. I have found some examples of painted floor in a general Internet search. Choosing a color isn’t going to be easy. I do like the crisp clean quality of white, but I don’t think this works with my furnishings. Grey is also a nice choice, but again I don’t think it will work. There are too many choices so it will take me a little time to consider. Has anyone painted a hardwood floor before? Good idea? Bad idea? Do it! I posted my sun room floor that was badly scratched by the former owner’s dogs. It’s white-ish with a faux zebra rug painted on it. It’s everyone’s fave room. I love your sunroom! Yes, I am seriously considering doing it… still working myself up to it. Ha! Your floor looks like it is oak. They are lots of work to refinish without the big equipment. My mother and sisters did her house by hand with a small electric sander. It took way more time than I could have patience for. They need updating again and I am elected. I can only say with wood do something so it does not deteriorate any more. We have a soft pine in our bedrooms and painted them with an oil base and it has held for many years. Good luck. I look forward to seeing the results. Yes, something does need to be done with them. I know refinishing is a lot of work and it’s very messy. As stated in my post it should have been done before moving in, but it wasn’t possible. I guess I am worried about painting it because if they ever were to be refinished it harder to remove paint… especially oil based paint. I think this is where my hesitation is coming from. Don’t blame you for being cautious. You are right that it is hard to undo when you paint. Good luck. 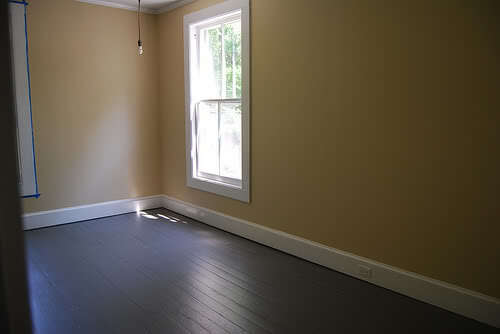 Last year we painted the floor in our middle sons study nook white and it looks great!!! We used a mat paint and its worn well. I really like your idea of a dark grey or black. 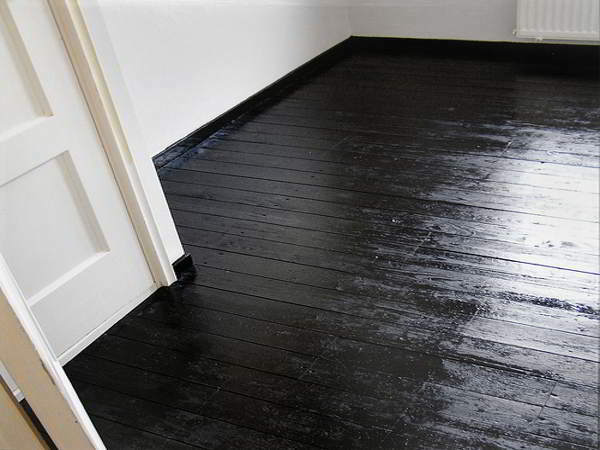 NO, the floors can be done with a light color stain, or the same color and they will look great. 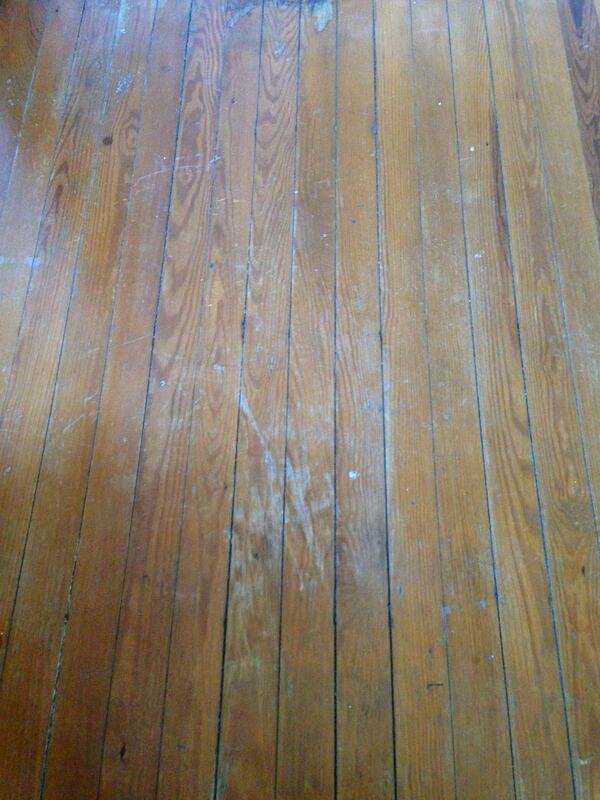 We did that to our floors when we moved in and have touched them up over the years. Our floors are not sealed. Sigh, I know… I know. I am getting more Nay than Yay from people I have seen face to face. lol You should of heard my mother when I mentioned it to her. It was like the end of the world! However, I still like painted floors in certain circumstances. You said it “in certain circumstances” I don’t think this is one. I am considering this as an option. A friend also suggested a simply wiping them down with a fresh coat of stain after a good cleaning. It’s what they have done and their floors look great. I did purchase a large sisal rug that will cover most of the areas of concern so I think all work out, but then there’s the floor in the hall! Thank you for stopping by.